Allowing you to extend your Wi-Fi signal, enjoy extra connections and boost the performance of your existing Wi-Fi, our excellent range of Netgear Wi-Fi range extenders will allow you to enjoy maximum coverage throughout your home. Within this product range, you will find a great choice of Netgear Wi-Fi range extenders including the Netgear WN3000RP-200UKS Wi-Fi Range Extender - N300, Single-band, the Netgear Nighthawk EX7000-100UKS Wi-Fi Range Extender - AC 1900, Dual-band, the Netgear EX6000 Wi-Fi Range Extender - AC 750, Dual-band and the Netgear EX2700-100 Wi-Fi Range Extender - N300, Single-band. 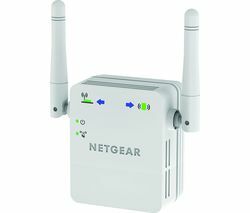 One of the most popular products in this range is the Netgear WN3000RP-200UKS Wi-Fi Range Extender - N300, Single-band. Allowing you to enjoy improved Wi-Fi access throughout your home, fast Ethernet connection and simple setup for to extend your Wi-Fi quickly, this device will instantly enhance the performance of your current Wi-Fi network. Offering excellent wireless coverage when it comes to using popular devices such as iPods, iPads, smartphones, laptop, game consoles and even smart TVs, this Netgear Wi-Fi extender is sure to become an invaluable addition to your home. You will be able to enjoy the freedom of walking around all areas of your home with your electrical in tow. 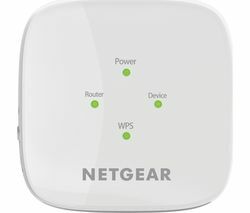 With its simple and easy to use plug and play design, this Netgear Wi-Fi range extender can be set up in minutes and the device also lets you securely connect computers and routers to this innovative Wi-Fi device. We also offer a fantastic choice of network switches and wireless adaptors too, so make sure you check them out today.